Atmosphere: Gritty on the outside, cool on the inside. Restaurant workers hang out here on their night off — always a good sign — joining foodies, yuppies, and hipsters for consistently great food, top-notch bartending, and an unpretentious attitude. See Best Boston bars for address and contact info. You might think that ranking a merely eight-month-old bar among Boston’s best is jumping the gun a bit, but this Central Square gem has so much going for it — not least of which is that history is on its side. 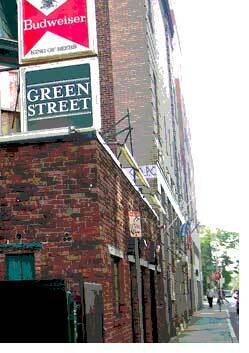 Green Street operates under Cambridge’s oldest continuing liquor license, issued in 1933. No matter how much you loved the former Green Street Grill, with its red vinyl seating and tongue-searing, Caribbean food, you have to root for the new Green Street (yes, just Green Street). The cooking, recently taken over by Pete Sueltenfuss (formerly of Eat and Eastern Standard), still rocks, and the vibe is still that of a hopping neighborhood bar. Most important, some of the best bartenders in greater Boston work here. They handle a crowd like experienced circus trainers while deftly executing an ever-rotating menu of vintage cocktails. Green Street’s complete, “A to Z,” drink menu features lots of rum-and-fresh-fruit-juice concoctions, as well as classics like the Iceberg (Plymouth gin, Ricard, mint, shaved ice) and the Phipp’s Fizz (Old Overholt rye, fresh lemon juice, Angostura bitters, ginger beer). Prices average $7-$8. Compare that to $10-$12 for far inferior, flavored vodka ‘tinis in most Boston bars. My father’s father was Daisy Black and I know that both men would be proud of Dylan–as I also am. Grandpa Daisy owned a small bar ‘n grill in Morris, Ill. and catered to anybody (of age) who had a nickel for a glass of beer. Hot dogs were available for a free lunch every day according to family legend. And he was always trying to invent a cure for the common cold. They say he had over a hundred recipies–each one called for an ounce of whiskey for starters. He was a modest man–like Dylan–and had a natural charisma perfect for the profession. Here’s a salute to both of them!